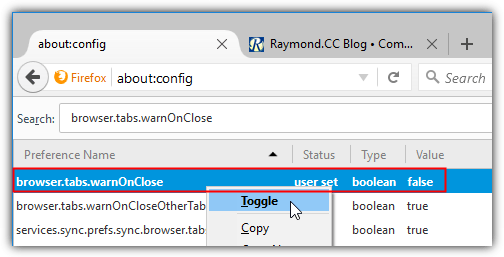 One of the very useful features found in the Mozilla Firefox web browser that isn’t implemented in Google Chrome despite many requests over the years is the ability to warn the user when closing the web browser with multiple tabs opened. This feature is very useful because there are times when we tend to accidentally click the X button located at the top right of the window which will terminate the Firefox program. It would be disastrous if one of the tabs has an important webpage that is based on session and cannot be restored by reloading or refreshing the page. 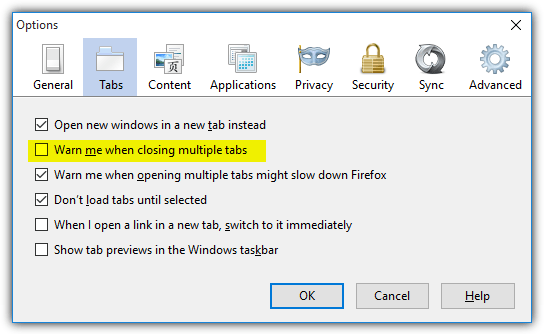 Clicking the Cancel button will keep Firefox running but if you’ve accidentally unchecked the option “Warn me when I attempt to close multiple tabs“, Firefox will no longer ask for your confirmation and will instantly close the program. 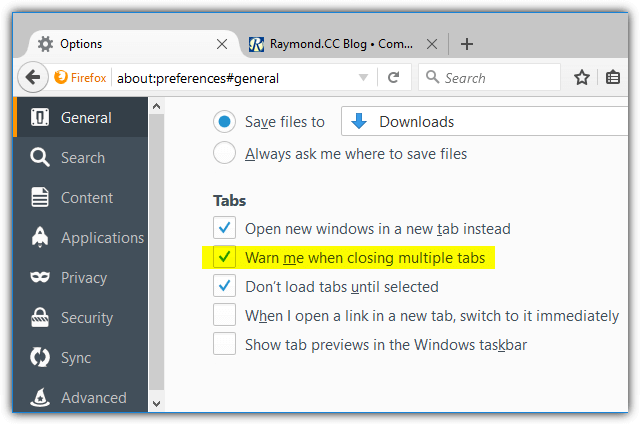 In this article we’ll show you how to restore back the warning on exit when multiple tabs exist. Click at the menu icon located at the top right and select Options. If you couldn’t find the menu icon, press Alt+T and select Options. When you’re in the preferences page, make sure that General tab is selected. Finally tick the “Warn me when closing multiple tabs” checkbox. This setting takes effect immediately without the need to restart your Firefox browser. For older versions of Firefox that still uses the classic preferences look, you can find the setting at Options > Tabs > and tick the “Warn me when closing multiple tabs” checkbox. Alternatively, the manual way of achieving the same result is by typing about:config in the location bar to access the hidden application settings. Click the “I’ll be careful, I promise!” button, and type browser.tabs.warnOnClose at the search bar. The default value is True which will warn you when closing Firefox with multiple tabs. If it is False, simply double click to change the value back to True, or right click and select Toggle. Although there might be a valid reason why the Firefox development team changed this behavior, this feature may be more convenient and useful to some people. If you prefer to have this option instead, it can be turned on by typing about:config in the address bar and click the “I’ll be careful, I promise!” button. Then type browser.showQuitWarning in the Search bar and change the value from false to True. Do take note that this browser.showQuitWarning option takes precedence over the browser.tabs.warnOnClose. This means that if you have the “Save and Quit” option enabled, it will override the default behavior of warning when closing multiple tabs. Additional Tip: If Firefox is somehow accidentally closed and you want to reopen all the previous tabs that were opened before Firefox was terminated, you can do so by clicking at the “Restore Previous Session” button located at the bottom right of the Mozilla Firefox Start Page, or alternatively you can press Alt+S to automatically open History from menubar and select “Restore Previous Session“. Odlicno decko !!! Thanks man !!!! Thanks, I don’t know why Firefox disabled this option. It works just fine for me… Thanks a Ton. Thanks! It’s working on Firefox 12.0 perfetctly. I love techies with great workable tips! Merci bien! Just what I was searching for! Thanxx! …just wanted to add to the comment I posted that I am using Firefox version 6 and this procedure still works …thanks again! It worked perfectly just as you said it would …thanks for the clear pictured sample instructions …Perfect! Thank you so much worked perfectly. Instructions were simple and straight forward! Thanks very much it worked and your instructions were quite straight forward! Excellent tip. Now I am reconsidering to use Mozilla as my default browser. Congratulations!!!!! Also works with Firefox 5. Thanks so much. Thank you a million! It works great with Firefox 5 as well! very easy and very cool !!! wow, really thx. really lazy to bookmark all those links. thanks mate. nice tutorial. easy and fast. Thanks, I was missing this feature very much! thank you. It is helpful really. Thank you so much, it finally worked! Nice!! it worked great!! thanks Raymond. Thanks a lot works great!!! I was afraid to fiddle with it after the pop-up warning but I trusted your advice, clicked on “I’ll be careful”, followed the step, and it worked GREAT! Thanks so much! oh thank you thank you thank you! I lost them all because I didn’t have time to search how to do this last night, but I didn’t want the internet on all night. I was not a happy camper – so thank you! you made my morning! Works beautifully as you have shown in your instructions. The screen shots were a great help. Thank you SO much for this! Wish I’d read it before uninstalling and reinstalling Firefox…several times. Lame that they disabled it by default, it’s like the best browser feature there is. you made it so simple AND easy to understand with your screen shots. Well done! Thank you! Have a great day, Raymond! never posted on a forum before. this had prompted me to. Excellent, it was wery simple and useful! Perfect. :) I really missed this feature since updating. I’m glad they didn’t totally get rid of it. Thanks for the walk-through! strange decision by the developers to change the option, but thanks for the tutorial! Excellent directions. Thank you very much. very nice, this is exactly what i was looking for. thank you, man. Finally I can save my tabs ! i am glad, too. very clear instructions!!! This was starting to annoy me! Thanks very much, very helpful. Don’t know why the developers disabled this by default. I was wondering where this had disappeared to! I’m really glad I found your page. Very helpful and clearly presented. Thank you. Thank you!!!! Such a great feature. Strange they got rid of this default. Thank you sir. This helped a lot! Thanks. This is a feature I use a lot. Thanks a lot. you are a real hero.. thx!! i was considering not updating because of this..now i can still be in love with firefox!! u da man, raymond!!! Thanks a lot for the info. It worked for me. What was the matter with the Firefox developers not making the save tabs option default?? hi!thanx for the info! it’s very helpful since i wal almost frustrated with the ‘non-save tabs’. Thank you, it was what I was looking for. Thanks a lot mate.. I also find it odd they would disable this by default, and have no way to toggle it thru the GUI. Thank You! I have been looking for a solution on the net. Luckily I found your site. Good Job! Nicely done! This is why I love Firefox. thnks mate , u r superman ! Thanks for the tip Raymond :D.
Thanks Ray, really helpful tip. Thank you very much. I was disappointed when I found out the same thing. Now my FF is Grrrrreat. hi guys thanks for helping me. Good one, just exploring FF 4 since last evening….